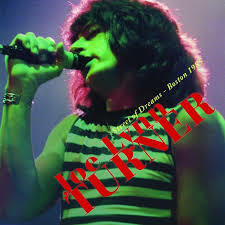 There’s probably only a handful of rock vocalists who have been more prolific than a certain Mr Turner. In over 30 years, the bloke has over 60 album credits to his name. Whether he likes it or not, he got to the masses prominence when he became the person the step into the Rainbow machine and follow the huge vocal talents of Dio and Bonnet. Like home or loathe him (I love him! ), he made the biggest impression on Blackmore as he stuck around longer than anyone else (apart from the Man In Black himself!). After Rainbow disbanded due to the Purple reunion, a solo album was a cast iron certainty. Where a certain Mr Bolton was about to jack it in and become the housewives favourite and amass a oligarch like fortune, JLT was a guy ready made to step into this FM friendly pop-rock market for the double denim, layered haired masses of the US! He’s best known for his Rainbow stint, a brief dalliance with Malmsteen (on what was to be Malmsteen’s finest album) and also Mothers Army, Sunstorm, Deep Purple (or should that be Deep Rainbow), Hughes Turner Project as well as churning out quite a few solo albums. The gig in question was recorded at the Boston Paradise and the band was pretty much all the guys who recorded ‘Rescue You’ – Chuck Burgi (Drums), Al Greenwood (Keys – he of Foreigner fame), Bobby Messano (guitar – from Starz), and new to the line up and fresh from Pat Travers Band, Barry Dunaway (bass). The album is an edited version of the night and was recorded for the King Biscuit Radio Show. Opening up the show is a demo from the ‘Rescue You’ period that wouldn’t see the light of day officially for another 20 odd years, the storming ‘I Found Love’. It staggers as to how this gem was missed off the album at the time, and it’s a high tempo rocker that just fits Joe like one of his leather gloves. As you’d expect, the set is heavily weighted to the 'Rescue You' album with 8 of the 11 songs receiving an airing here tonight. Lets face it, this is a snapshot in time of Joe at his finest – songs like ‘Losing You’ and ‘Rescue You’ are two of his finest ever committed to vinyl. Unlike lots of other bands, this live album is completely untouched, warts and all! That makes for a refreshing change indeed. His voice is pushed a little (‘Young Hearts’), but that also makes it all the more believable and enjoyable, especially as he is endorsing this release from Cleopatra. Joe throws in two of his best Rainbow songs, ‘Stone Cold’, and ‘Street Of Dreams’ and both are faithful to the originals apart from a lack of solo on ‘Stone Cold’. ‘Feel The Fire’ sounds as if its been nicked right out of Michael Boltons cold, dead grasp. Messano even gets a few minutes to ply his trade, thankfully it doesn’t contain the usual 80s staples of separate drum, bass and keyboard solos, although there is a bass slapping solo in the very good, funky and extended version of ‘Get Tough’ in which the band jam like crazy and is a definite highlight of the set. Thirty-one years on from this, and Joe has almost become a Spinal Tap parody of himself, such as in last year's UK acoustic gigs, he summoned the spirit of David St Hubbins (not vocally, just verbally). This aside, his recent gig at HRH AOR proved that he still has what it takes and possesses a mighty fine set of pipes – DESPITE not playing a single song from this tour, or Malmsteen or anything else come to think of it. Apart from his Rainbow years, JLT and this line up in particular NEVER, EVER sounded as good and as tight as this!